It starts with good fitness. If you’re feeling good, fit and fresh you’ll usually have a good race on any course. Enumclaw for me was just one of those days where the pain wasn’t registering. When that’s out of the way you’re just out there riding having fun. And when that’s going on you’re fully aware, making fast lines happen and 100% checked into the task on hand, the perfect marriage! Finding speed is simply not riding in the muck. That course wasn’t muddy by my standards but I saw a lot of covered bikes. It’s easy to get out of rhythm and tossed into bad slow lines. I think that’s the case with many of us. When your not suffering you can usually put more into where and how you’re putting your power down. A lot of this line selection happens in pre-ride. If you can see it there you can usually see it racing, but not always. In these sort of courses I prefer to go out on my own controlling my own destiny and no, I don’t always have this luxury. Often the course, your fitness level or your competitors force you places you don’t want to be. I’ll also point to the course design itself. That really was an excellent layout. It reminded me of old school SCX courses at Sea Tac where you’re legs hurt after the runs and you had to focus 100% of the time on your lines. No spacing out or drifting! The course was hard and that to me is what CX should be. It demanded of course good fitness but also bike skills, agility and creativity. The on-off punchy style suited me and my strengths. I’m not surprised I did so well, I usually do when I’m enjoying myself. And he’s right, form and fitness are so elusive as you get older, celebrate those times you’re in it, as Russie did. For me, this season had no measurable results, except for being out there, finishing every race, and at the end I fit into some fine Italian kit from Nalini. Props to Matt Hill, cause without his encouragement, I’d have ended the season after CrossVegas. He insisted I start AND finish the races. You bigger guys like me, know what I’m saying about Italian Kitarexia. It was a long season too, with Worlds in January, where I think I had one of my best rides from the back of the starting grid. 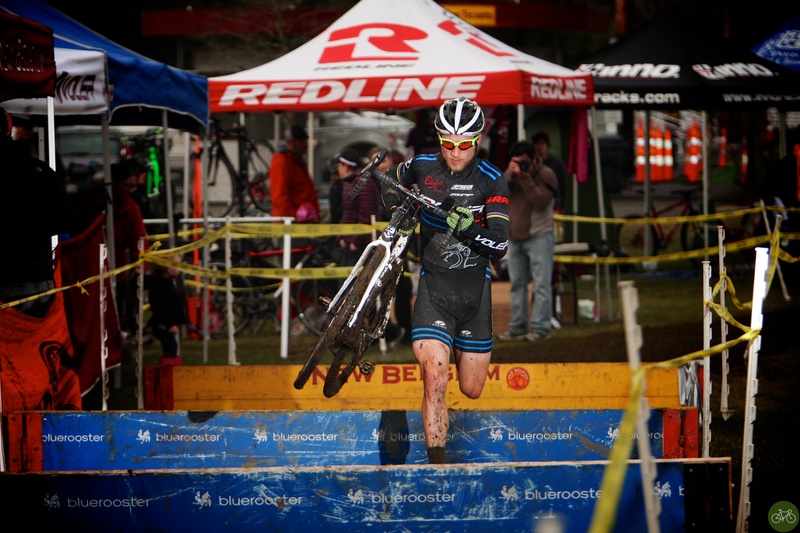 Russ is a racer to watch next month in Colorado at CX Natz. He’ll have on his World Championship jersey and Hugga cap. Up next, big miles in Maui and then more dirt in 14. Photo: DBC Photography who is shooting in Belgium next with the EuroCrossCamp.